Rep was very professional and helpful. He is a keeper !!! Joel is very professional and we trust him with our security system. We love SafeTouch and appreciate that they send the same technician each time and always make our appointments in a very timely manner. Arrived early, polite and conscientious. Couldn't be better. Mark arrived during the appointment window, i.e., on time. He was fast and thorough and definitely engaging. He explained what he was doing, as well as provided a couple of quick tips on how to interpret indicators on the key pad. Well done! Anthony was very prompt and professional upon arrival. He immediately knew exactly how to correct the issue at hand. Within a short of time he had our system back on line and working securely. 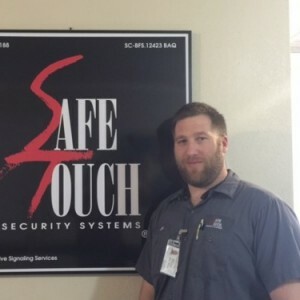 He definitely is an asset to SafeTouch Security. Thank You! a very professional young man. came in, did his work and then some. I would suggest you promote him to supervisor but then you would lose one of your best workers. The technician showed up at the scheduled time and took care of the new camera doorbell quickly. I am completely satisfied with the results. Joe did an excellent job. He was friendly, and his professional manner made me feel he that was trustworthy which is very important in his business. He worked quickly and seemed knowledgeable about my systems problem. I was very satisfied. Joe E delivered great service by installing six new window sensors in a quick and professional manner. *** *. delivered great service installing six new window sensors in a quick and efficient manner. The tech Joe came on time. Took care of testing the system and replaced the battery in the fire detector. Polite, and caring,, thank you Safetouch for hiring great people. Joe E provided prompt and thorough service for both the original reason for the service call plus he replaced one motion detector and batteries for three wireless devices. He was prompt, professional, and efficient. Joe E. From Safe Touch was very professional, knowledgeable and prompt. He was able to diagnose our problem, repair it and I still was able to make it to work. Joe is definitely an asset to the Safe Touch family. We've depended on Safe Touch since 2005 and they've never let us down. My Safetouch Service Pro, Joe E., was awesome! He promptly determined the reason for my system's malfunction, and he explained same to me in a kind, professional manner. Joe E represented Safe Touch extremely well. He fixed what he came to fix, checked other items, patiently answered my questions and explained why I had an alarm signal a few weeks ago. I am very pleased that it was Safe Touch that called to inform me I needed service before it became an issue. THANKS SAFE TOUCH! Fantastic technical support. Checked everything when done to ensure all was working & replaced stickers on windows. Couldn't be happier. Joe has come out to help a couple of times and have been great in working on the issues and helping us to understand how and why some things happen. Joe E. from Safe Touch serviced our alarm system today, he was courteous, professional and had us back in service. Highly recommended. Joe was outstanding. Thanks SafeTouch for sending your best Tech to me! Service Tech, Joe E provided excellent professional service. Thank-you SafeTouch Security. Joe was very professional and was there on time. He fixed everything that needed fixing, and it didn't take a long time. I recommend a 10 for his work! Safetouch is always fast, courteous and easy to work with. I have confidence my home is safe and monitored whether I'm at work or on a trip. Awesome tech. Explained everything from beginning to end.Answered all of my questions and did so with a smile.Very courteous and professional. Perfect asset to your company. Great job Joe. *** arrived promptly at the scheduled time. He fixed the problem at hand and then did an evaluation of the entire system to ensure there were no other problems. Very efficient and professional.